This varifocal aspheric lens is manufactured using low dispersion glass for better performance. Intended for cameras having up to 3 Megapixel resolution, it's great for when a manually adjustable focal length is needed. The focus and iris are also manually adjustable. 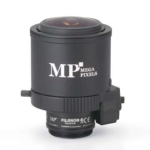 When combined with a 1/2 format sensor, it offers a zoom ratio of 3.4x.